A Clever And Creative Festive Treat! 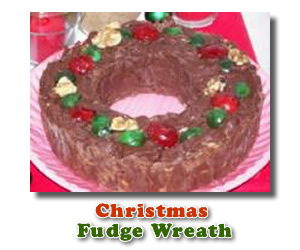 A Christmas fudge wreath is a wonderful way to make the holiday a little more festive. I can almost guarantee that your family and friends will feel extra special if you take the time to prepare this delicious Christmas fudge recipe. This particular chocolate fudge wreath is quick and easy to assemble, but doesn't look like it. In fact, the finished masterpiece looks like you really labored over it. You can certainly follow this recipe just as it is, but if you are looking for a slightly different twist, consider some of the variations that I have included at the bottom of the page. You might even come up with some variations of your own. If you do, please do share them with us. We'd love to see your own finished fudge wreath when you've got it made. Take a few moments and add your photos and tips here. Without further ado, here are the simple instructions for assembling your edible Christmas wreath. Grease an 8-inch round cake pan with softened butter. In a saucepan over low heat combine chocolate and butterscotch chips, condensed milk and vanilla. Cover the empty condensed milk can with plastic wrap and put it in the center of the round cake pan. Stir the chips and milk until they melt together, about 3 minutes. Stir in nuts and raisins. Scoop the fudge into the cake pan all around the plastic-covered can in the center to form a wreath or ring shape. Don't smooth it out - leave the bumpy appearance. Be sure the can stays in the center. Cut the red cherries in half with scissors and the green cherries into quarters. Use the green pieces to make leaves and the red to make holly berries. Decorate the fudge with several groups of holly berry sprigs made from the cherries and garnish with walnuts between the sprigs. Chill until firm. Remove the can from center. Loosen the sides and bottom of the fudge with a spatula. Cut the fudge into thin slices to serve. To give the wreath as a gift, wrap it in cellophane and secure with a bow or ornament. Substitute the chocolate chips with white chocolate chips, 1 1/2 ounce bag plus 1 cup. Substitute 1 to 1 1/2 cups of shelled natural pistachio nuts for walnuts. Substitute 1/2 cup dried sweetened cranberries for currants. Swap butterscotch for peanut butter chips. Swap large whole peanuts for walnuts used in original recipe (such as peeled Virginia Peanuts. Swap 1/2 cup large raisins for currants in original recipe.